For the first time in years, new funding is being allocated for Trial Courts in Governor Jerry Brown’s proposed 2018 state budget. 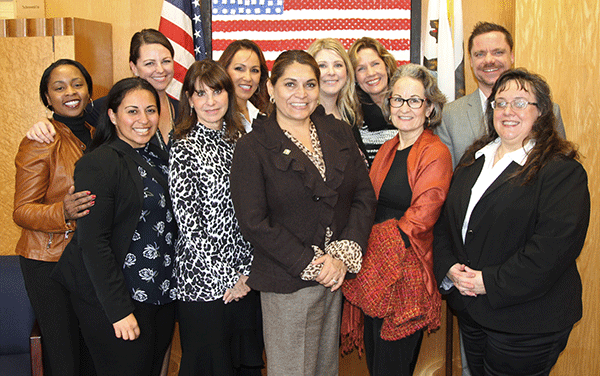 Standing together to advocate for a fair share of dollars for Orange County’s Court system, OCEA members and workplace leaders met with legislators this week in Sacramento to press our case. The additional funding is a good start, but it is not enough to restore funding in our court system. OCEA members were among the first groups in California to lobby elected officials on this topic. This week, seven OCEA members as well as OCEA staff traveled to Sacramento and met with legislators, policy advocates and state finance officials. The delegation included OCEA President Lezlee Nebee and members Teresa Tico, Marci Dambert, Aimee Skochko, Alicia DuBois and Sherrie Lane. We met with Assembly members and State Senators from both political parties using plain speaking and firm data to describe the challenges we face every day in providing justice without adequate resources. We described in detail how years of budget reductions impacted not only Court workers but constituents and public safety. Above all, your workplace leaders fought hard on your behalf and on behalf of your coworkers. We started the day at the offices of OCEA’s Sacramento-based lobbyist Aaron Read & Associates, which detailed all they’ve been doing to advocate for increased court funding, which helped lead to the increases in the Court budget we are seeing in the Governor’s proposed spending plan. Then together, our lobbyists and OCEA staff members met in back-to-back meetings with the following lawmakers: Senator Josh Newman, Senator Janet Nguyen, Assemblywoman Sharon Quirk-Silva, Assemblyman Tom Daly, and staff from the Senate and Assembly budget committees. Then OCEA General Manager Jennifer Beuthin brought us to the Sacramento office of the California Labor Federation—where she also serves as an executive board member representing 2.1 million workers across the state. There, we were able to meet with Secretary-Treasurer Art Pulaski and the Federation’s advocacy team to provide them an update on our meetings and discuss how OCEA’s labor allies can work to maintain our momentum. All of our meetings were positive and effectively advanced OCEA’s position that OC Court workers need relief! In the coming weeks we will be meeting with OCEA Stewards and further coordinating with our legislative allies. OCEA members showed leadership and strength in fighting for a fair share of Court funding. If you would like to learn how you can get involved in the fight for justice in the Court, email OCEA Organizing Director Tim Steed at tsteed@ocea.org. It will not be easy to correct the years of neglect suffered by the Court system. Rank and file workers have made sacrifices while executives and judges continued receiving raises and perks. We are working today and will continue to fight to reverse these injustices. We can get this done by standing together and being there for each other. That’s how we will win.